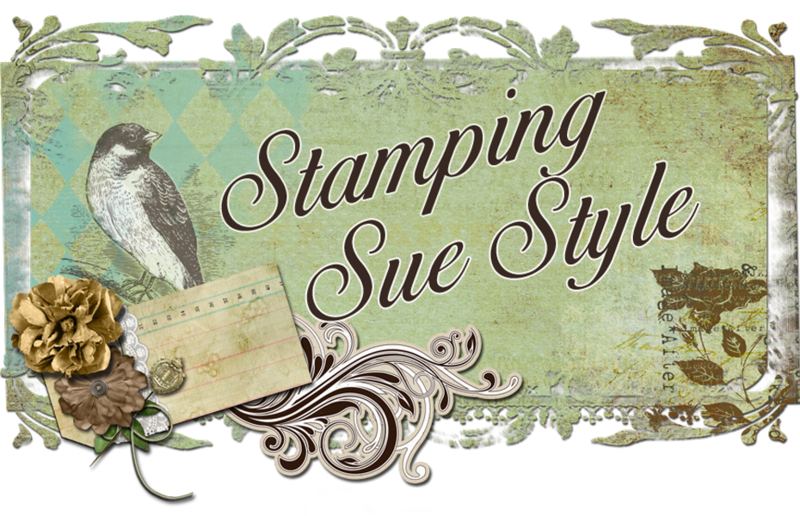 Stamping Sue Style: Raise it up at Frilly and Funkie ! Raise it up at Frilly and Funkie ! I want to see lots of layers, lots of panels and/or lots of elements on your shabby chic or vintage project, BUT they must be raised up! Whether you choose to use pop dots, foam squares, silicone glue or another means of support, make sure they stand tall! So, this theme got me thinking about how I could create layers and also height ! Then I spotted my stash of cardboard, perfect ! 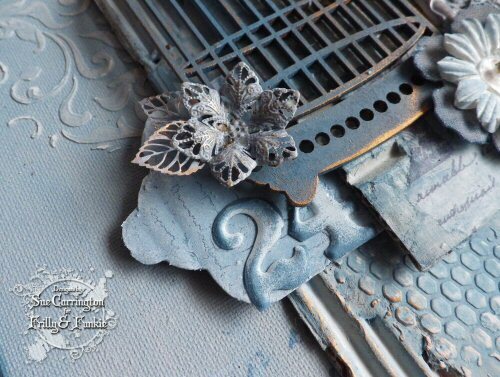 To start with I used Grunge Paste through the Tim Holtz Flourish stencil and applied it to opposite corners. I gave the canvas a wash of watered down acrylic paint and also did a little stencilling. When the Grunge Paste had dried I lightly sanded it to make it look a little shabby. Now, I meant to take more step by step photos but got carried away so bear with me ! I cut two pieces of cardboard and ripped a little of the surface away. I gave the pieces of carboard a wash of acrylic paint and on the larger piece I used some more Grunge Paste through a TCW stencil and also through the Wendy Vecchi Alphabets stencil. 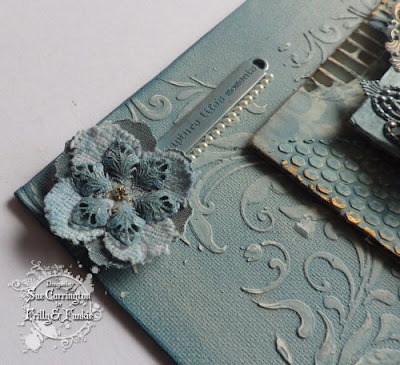 I stamped the butterflies from the Tim Holtz Papillon set and the Wendy Vecchi Script background stamp onto some tissue paper and glued it to the smaller piece of cardboard. I gave it a coat of Glue 'n' Seal to protect it from the watered down acrylic paint. I cut out two tags from carboard and these are what are creating the height sandwiched between the two larger pieces. I painted the tags with a darker blue acrylic paint then added a coat of Crackle Glaze and dabbed on a lighter colour using Cut 'n' Dry foam. All of the embellishments have been painted with acrylic paint and I've rubbed a little Treasure Gold over them too. The little lacey buttons are from my stash and are part of a gift of buttons from my very lovely crafty friend Ruth. The key and little dragonfly are from The Funkie Junkie Boutique and have also been painted with acrylic paint. In the above photo you can see the sanded back Grunge Paste through the Flourish stencil. The large bird cage is by Kaisercraft and I've painted it with acrylic paint then lightly rubbed some Treasure Gold over parts of it, I had the idea of a gilded cage in mind. 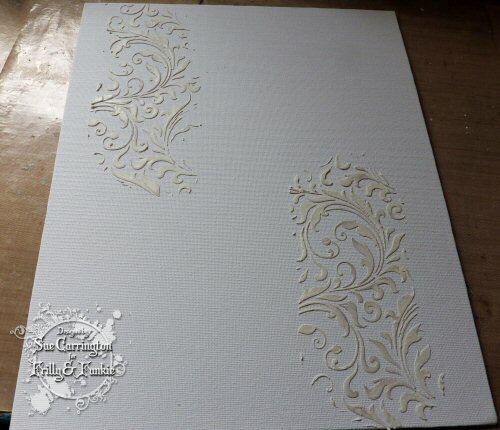 I covered some white card with some sticky back canvas that I found in a cheap craft store, then die cut a flower using the Tattered Florals die. I then dabbed some paint onto a material Prima flower and layered it on top and then added the metal flower as the last layer. I've used a WordBand that I've also dabbed with acrylic paint and added a string of small pearls. I hope you get chance to join us for this challenge and make sure you hop over to Frilly and Funkie to see the fabulous projects from the rest of the DT. How gorgeous, Sue. Just popped over from Linda's FB post. Fabulous! I absolutely love your raised up layers, Sue - and the soft colour tones are just gorgeous. Fabulous stencilled texture throughout too. Absolutely love this pretty piece Sue. You definitely got all the layers in and the almost monochrome look means there is no chance of it looking too busy. Everything is beautifully balanced and the embellishments are perfect. GORGEOUS! 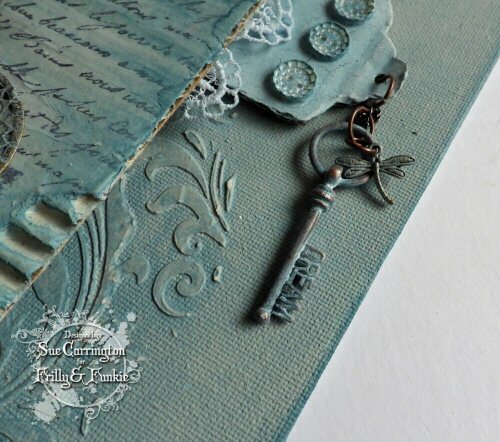 love the details...the textures & the color! Waw... What an awesome project you created. Love all the layers and the soft colors. The flower with sticky canvas and a metal flower on top is just gorgeous. 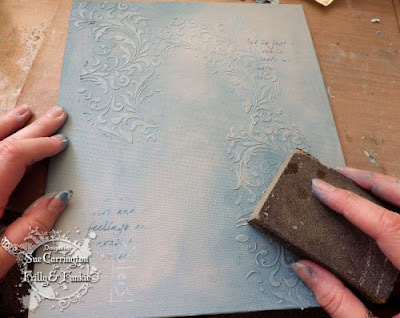 The stenciled paste is beautiful. It makes a great impact. I really admire your project. Thank you for sharing. It was such a great inspiration. Your canvas is a true work of art! I don't know where to begin... You managed to include so many luscious raised layers with the perfect placement of each element. The embellishments are just right, and the coloring you created with the watered down acrylic paint is fabulous. 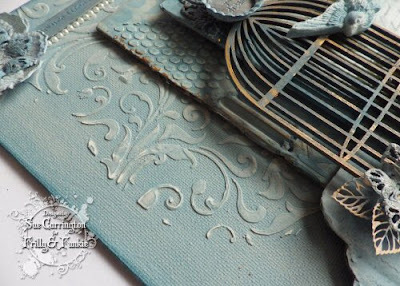 You would never guess that the gorgeous tags started as humble pieces of cardboard!! Thank you for inspiring me...AGAIN and AGAIN!! 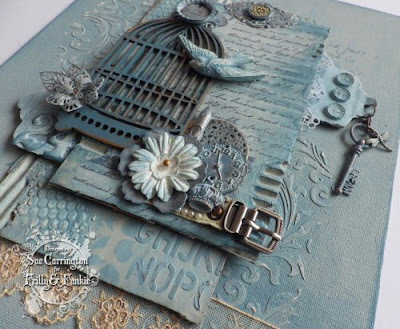 Gorgeous canvas with lots of wonderful elements all pulled together with your monochromatic colour scheme. Sue, I love this canvas. All the textures and goodies have certainly raised to the occasion! Gorgeous! Re-following your blog and so sorry that you had to start it over! Happy Weekend! Such a fantastic project, great elements. 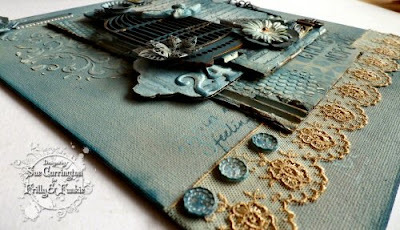 So many wonderful layers and embellishments - I could seriously look at this all day long. Gorgeous piece!! 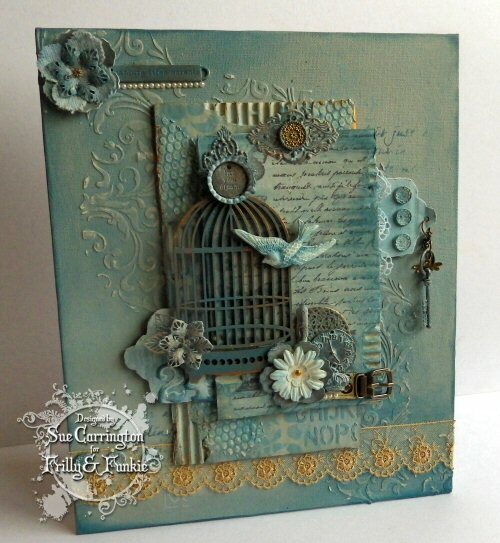 So beautiful Sue, right from the shabby stenciled background all the way to the top of that lovely birdcage! Look to the stars ! 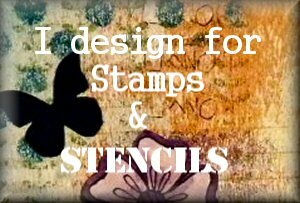 New JOFY stamps at PaperArtsy ! Class update and new class details !